"Attitude is everything" is the Livezey family motto. It's printed on T-shirts and pink bracelets the family wears to honor and encourage one of their own, Hollis Livezey Youngner, as she receives treatment for breast cancer. And those three words have helped Hollis persevere since her diagnosis five years ago. They also recently helped her through another journey: training for and finishing a half marathon during the 2017 26.2 With Donna National Marathon to Finish Breast Cancer. "I was bound and determined that I was going to cross that finish line," Hollis says. And on Sunday, Feb. 12, she did. Getting there wasn't easy. Hollis, who receives care at Mayo Clinic's Florida campus, experienced three cancer recurrences during her training. She had periodic radiation treatments and daily chemotherapy to try to keep the cancer at bay. "Lots of days I'd come home from my runs crying," she tells us. She was exhausted. And she was angry. Angry that she'd been diagnosed with cancer when she was just 31. Angry that her treatments kept her from running as fast as she would have liked. But just as she had done countless times in the past five years, Hollis transformed her pain and anger into something positive. "I was determined to prove to myself, to everyone, to cancer, that it's not going to stop me," she says. "I'm proud of myself that I didn't give up." She's not the only one who's proud. Forty-one friends and family members ran the race with her, and a large cheering section was on hand to cheer her as she crossed the finish line. That group included her daughter, Hayes, who had the honor of placing a finisher's medal around her mother's neck, and her doctor, John Moss, M.D. Dr. Moss, a critical care physician at Mayo Clinic, has been an important part of Hollis' life since he helped save it two-and-a-half years ago. He tells us he was there to let Hollis know that he and his colleagues were proud of her accomplishments, too, and awed by her attitude. "She is truly an example of courage and determination," Dr. Moss says. "Hollis never gives up. 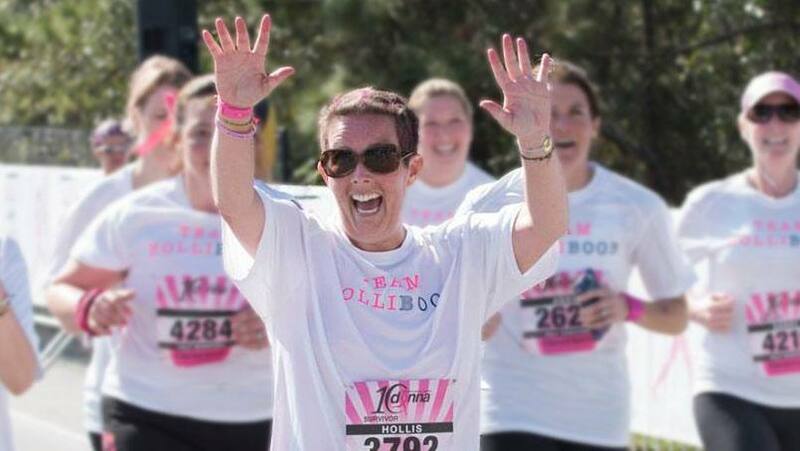 She looks at breast cancer in the face and continues to challenge it." And she does so, says Dr. Moss, with an eye beyond her own diagnosis. Hollis "is an advocate for others fighting breast cancer," he tells us, adding that "she is constantly helping others without a focus on her own challenges." In fact, helping others is one reason Hollis openly shares her story. "I hope that something good will come out of me getting breast cancer at such a young age," she tells us. "I hope I can help other people, and encourage them to keep fighting." And though she's happy to have the race behind her, Hollis has already begun thinking about next year's event. "I swore up and down before the race that I was 'one and done,'" she says. But the race experience was "so powerful, and beyond amazing," that she's now rethinking that promise. "I haven't committed yet, but I'm definitely thinking about doing it again." You can check out Hollis' finish-line reunion in this video (she's at the 1:25 mark). Then the race is on for you to add your comments below before using the handy social media tools atop this page to share this story with others.